This Friday's blog is the result of a couple of conversations I have had this week with members of the LinkedIn community. The topic is women's only groups and whether there is a need for them to still exist. Also, is it acceptable that some female consultants and advisers choose to only do business with female clients? The frustration with some males is evident and understandable. So much for talking about diversity and the need to integrate variety and differences in business, how could anyone proactively and willingly EXCLUDE male clients and male businesses? So what is next, excluding people on the ground of religion, sexuality, race and so on? And are we going to shut the Golf Clubs to the ladies again? Personally, the answer must be a clear and resounding NO, yet I believe that there are still one or two utterly compelling reasons why women's only group will thrive a while longer and why some women may proactively chase female only business. I for one work a lot with women and not because I wish to exclude men, but because by and large I seem to 'click' with women, building a deeper bond, instilling trust and achieving mutual understanding relatively rapidly, particularly when it comes to one to one mentoring/coaching relationships in which women invest plenty of emotional capital. What I am being told by female clients is that she can work with me because we are 'on the same wave length' or I am 'like-minded'. In simple terms, the things I say or have experienced invariably resonate with other women and so we can empathise with each other. This feeling is in my experience amplified in group situations and ultimately boils down to one main issue: Emotional Safety. I see this again and again and most recently, while running a female leadership group, I raised this point with the women in the room. I asked: 'Was it ever an issue for you that you were going to attend an exclusively female leadership group?' The overwhelming response was that participants had agreed to join the group BECAUSE it was a female only group and that, had men been there, they would not be able to feel safe, thus open up and be forthcoming in their interactions with me, the facilitator, and with each other. I also know this by experience, having facilitated hundred of groups in many different contexts; the dynamic in the room would have changed totally had male colleagues been in attendance. Context, however, makes a massive difference. In the example I have quoted above women come together to learn, reflect, share and grow personally and professionally and for that to happen they must be able to open up and reveal their weaknesses, fears and hope in a totally safe, non threatening environment, without bias, judgement or competitive behaviour. Whereas, in many other circumstances in which the emotional investment is not quite as strong, everyone actually benefits from a mixed and highly diverse audience....innovation, sales and R&D are just three that come to mind. So in summary emotional and personal safety means a big deal to women and it is a key reason why female groups with a strong social and educational component won't run out of business quite as yet, and why some female professionals will chose to work with women only businesses. 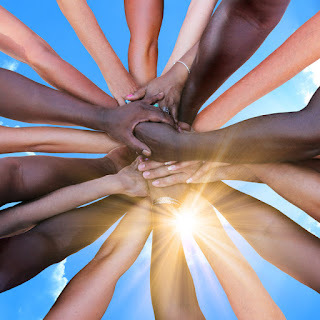 Like-minded and in tune as we might be, there will be always situations in which a wider and more inclusive perspective will however provide for a more effective outcome. Are Women The Unsung Resilience Heroes?